a great video of a rube goldberg device that fills an entire house. not quite as adorable as yesterday’s kitten video, but still pretty awesome. a cupcake and crossbones pendant – tempting. but realistically, where would i wear it? soooo i got this tshirt instead. 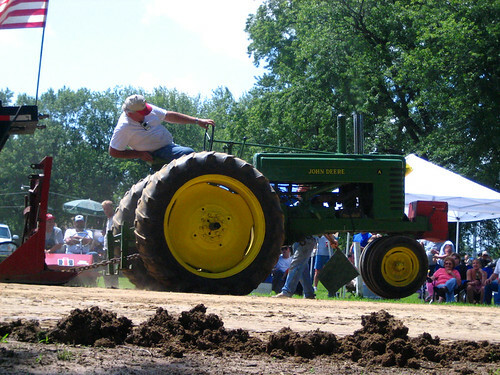 internet, old friend -and- tractor pull! this week has been CRAZY. i’ve been all over northern illinois with my family and i’ve only been able to check my email THREE TIMES. THREE. if you know me, you know this is insanity. generally i’ll check my email three times in – seriously – 15 minutes. i’ve got this stuff to finish up for fb and i’ve only had time to work on it once. luckily i knocked out a good portion in one swipe, but still. i’m feeling the compu-withdrawal with a side of no-internet shakes. tractor loses traction (or astoundingly makes it to the end of the track effortlessly), flag guy waves the flags and unhitches the tractor while the hauling tractor re-hitches and the guy on the sled releases the weight and radios the distance pulled to the officials. all of this happens in just a few minutes. there’s probably only about a minute between when one tractor stops pulling and the next one starts. photos will be posted in coming weeks are posted, including one of this guy in a john deere (the only john deere i saw pull [we're a john deere family]) that made it all the way to the end of the track. i saw this video about trusted computing awhile ago but i forgot how a) awesome it is; and b) how cute that little guy in his wee bucket is.